Female Fan of the Year – Colleen McKaye, Crows Supporters Group (cheer squad). Male Fan of the Year – Shaun Dux, The Demon Army. Supporter Group of the Year – The Demon Army (cheer squad). Colleen McKaye is involved in almost every aspect of the Adelaide Crows Supporters Group (CSG). As part of the committee, Colleen is described by fellow supporters as ‘Australia’s biggest Adelaide Crows fan’. She is part of the banner making team, organises buses and tickets for interstate games, and attends all home games and some interstate matches every year. Well-known by the club and players, Colleen has followed the Crows since they entered the AFL and helps organise fundraising raffles and events. Her dedication shines through when she has missed whole quarters to help set up after-match functions. At games, she gets the crowd going with chants. Colleen, whose number plates read Crow13, has had two CSG roles this year – Assistant Treasurer and Events/Fundraising. As part of that, she organised this year’s CSG Sportsman’s Night with two weeks’ notice. Colleen is also a devoted mum to her son James. If there is something Melbourne-related happening, Shaun Dux will probably be there. 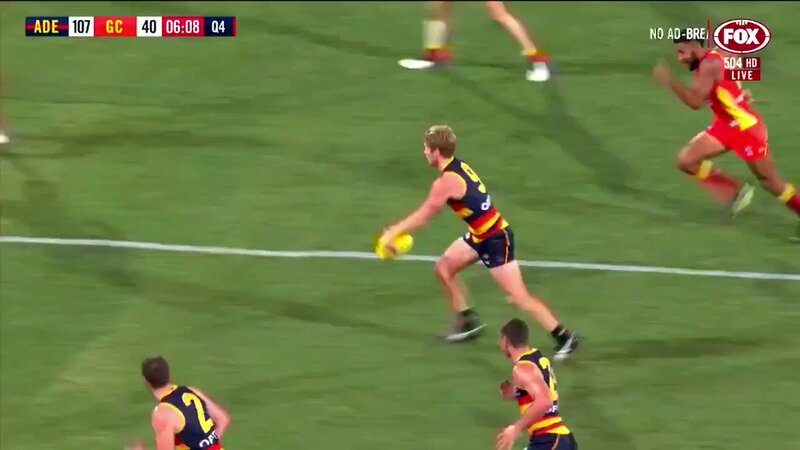 The Demon Army member attended almost all his club’s AFL, AFLW, VFL and VFLW games this year. If that’s not enough, he also attends many training sessions. Shaun is the red and blue sheep of his family. His mother, brother and sister follow Richmond, but his grandmother told Shaun, who was born at the same time and in the same hospital as Demon legend Robbie Flower’s son, that he had to follow Melbourne if he wanted to step inside her house. The devoted Demon will travel to Perth for Saturday’s preliminary final against West Coast and celebrate his birthday the day before. Shaun hopes it will be a weekend to remember! The Demon Army (cheer squad). The Demon Army has gone back-to-back after another stellar year of barracking. The Army now has a record 630 members, and thanks to the support of its interstate branches, the group filled its allocation for every interstate game this year. Ryan Sinclair, Sophie Galer and Suzanne Considine have all helped co-ordinate the Army’s resurgence since 2013. They rebranded from Cheer Squad to Demon Army and embraced those who wanted to help. Numbers rose from 250 in 2012 to more than 550 in 2017 and now 630. The group organises social events and places a huge emphasis on inclusiveness, which has encouraged many more fans to become involved. The atmosphere behind the goals at Melbourne games is now electric, with giant player face cut-outs, huge flags and a sea of red and blue. 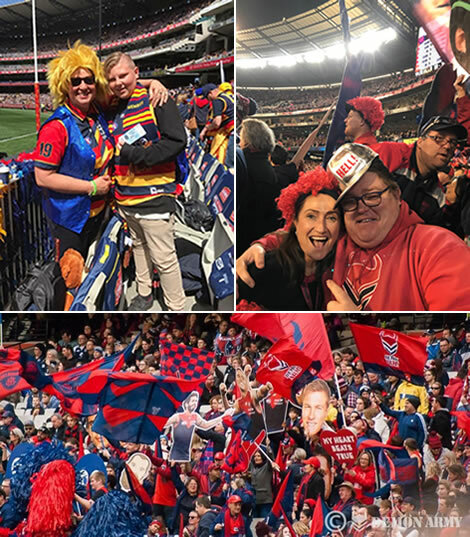 Following Melbourne’s big win over Hawthorn on Friday night, Suzanne and her fellow co-ordinators are working hard to ensure that a large part of their Army makes it to Perth for Saturday’s preliminary final against West Coast. Suzanne hasn’t missed a game for about eight years and will be there with red and blue bells on. “Everything from now on is a bonus,” she says. Error: Error validating access token: Session has expired on Tuesday, 14-Aug-18 19:21:14 PDT. The current time is Sunday, 21-Apr-19 08:01:31 PDT.